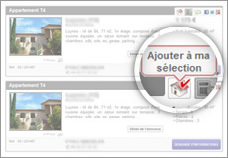 Conveniently sell your property with the advertising offer « Premium Liberté » ! Within 4 weeks you have the possibility to extend the advertising, until the property is sold (offer validity: 1 year). You only need to connect to your "Private Area", using your login information which will be send to you once you subsribe to this offer. An advertisement offer with an excellent level of price and quality, an effective solution for selling your property with comfort.